Northern Ireland's Chief Constable Sir Hugh Orde is to leave his post and become president of the Association of Chief Police Officers (Acpo). Sir Hugh, who has been in charge of the PSNI for seven years, narrowly missed out on becoming Metropolitan Police Commissioner earlier this year. Acpo's 342 members voted on Wednesday for their choice of president. Sir Hugh said his time in Northern Ireland had been "a rough and challenging ride". He said he was leaving the Police Service of Northern Ireland in a healthy state. "I've been here for nearly seven years - I said I'd come for five. I've got mixed emotions about going - this is a great organisation to lead and it's done outstandingly well. 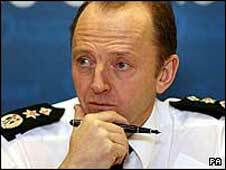 Whoever replaces Sir Hugh Orde as head of the police in Northern Ireland will have to be a quick learner. The security threat is at its highest level for a decade, and it is likely that the next chief constable will be a senior officer parachuted in from England. It has been known for some time in Belfast that Surrey-born Sir Hugh was looking to get back to London. Only this week, he spoke in a BBC Radio Ulster interview about his hopes of becoming president of the Association of Chief Police Officers (Acpo). In the same interview, he was asked to choose his favourite music. The first song he chose was Bruce Springsteen's 'Born to run'. "The time has come (to leave) - fresh eyes look at things differently and we need to move in a slightly different direction." Home Secretary Jacqui Smith said Sir Hugh had an outstanding record of public service. "I look forward to working with him as we embed the reforms to policing announced in last year's Green Paper, from further cutting police red tape to building public confidence and tackling local issues that matter to people across the country," she said. Sir Ken Jones, current Acpo President, said Sir Hugh "brings a wealth of experience and leadership" to the association. "Increasingly the service and its leadership are being drawn into political controversies and it will fall to Sir Hugh to steer us on a sure path through the forthcoming period, both up to and beyond the next general election," he said. The chairman of Northern Ireland's Policing Board, Sir Desmond Rea, congratulated Sir Hugh but added that he regretted losing him. The chief constable will assume his new role in the Autumn, and the process for appointing a successor will now begin, Sir Desmond added. The Secretary of State for Northern Ireland, Shaun Woodward, said Sir Hugh had changed the face of policing in Northern Ireland. Sir Hugh told the BBC's World at One that policing and politics were "inextricably linked" but the strength of UK policing was that chief constables were operationally independent and held to account. "I think our model of accountability is very good, we need to hold on to that principle, but that doesn't mean you don't communicate and have sensible conversations and influence and advise," he said. "I do think that the president of Acpo and other chief officer colleagues are the professional voice of the policing service and politicians need to listen to us." On the issue of how long suspects should be detained without charge, Sir Hugh said: "No chief constable I know wants to keep anyone in custody a day longer than they absolutely have to, but we have an over-riding obligation to protect our communities and our people." Sir Hugh said it was important to learn lessons from incidents such as the death of Ian Tomlinson, who was pushed by a police officer at a G20 protest in London and later died. "Policing is not a science, policing is as much an art as a science, and it needs individual officers to take the ultimate responsibility for the actions they undertake and they do on behalf of the public. "When they get them wrong, that frankly needs to be acknowledged." Who will take over from Sir Hugh?